The focus of Washington’s efforts has been training to make sure staff understands their roles and the obligation to make consular notifications. The Assistant Attorney General’s office helped with training and is always notified in cases in which immigrant children come into care. The state’s collaboration with the Mexican consulate included the development of a Mexican Consulate card. Staff distributes the card to Mexican immigrant families in their caseload. The card informs families about how to contact the Mexican Consulate and describes the services the consulate can provide to Mexican families that are involved with the child welfare agency. Consulate staff also participated in the state’s training efforts to instruct child welfare workers and stakeholders on how to contact the consulate and what the consulate can do for families of foreign nationals. The Mexican Consulate has partnered where they have resources the state does not. The Consulate helped develop and funded printing for the consular card. They partner with state staff to set up home studies on relatives in Mexico and sometimes provide translation services to families for court proceedings. They have, on occasion, set up transportation for a child to Mexico and have located culturally appropriate services in rural areas that may not have services available in Spanish. The Consulate also generally provides support for families to make them more comfortable with child welfare proceedings. This has gone a long way toward building trust with the Hispanic community. Since the effort began, child welfare staff have found that families are less likely to flee during a child protective services investigation because of fear that child welfare officials will turn them in to immigration authorities. 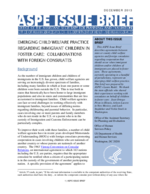 The primary message in the State’s policy is to bring the Consulate(s) into the discussion immediately if there is an immigrant parent or child involved in a foster care case. They have had many cases in the past that would have gone more smoothly if the consular notification had happened at the outset. This ensures the children are represented properly. Most of their cases involve Mexican nationals but there have been some involving other nations as well. The state has a large Russian population and has recently been doing some work with the Russian Consulate, particularly around family services and translation for Russian speakers. Local offices reach out to other consulates as needed.